We think we’re the best Internet Service Provider in the country, and not just because we supply great services and products. The customer service that we provide has the highest satisfaction results out of any provider in Australia! And our broadband churn rate – the number of customers who leave us – sits at one of the lowest in the country. So when we win industry leading awards that recognise this commitment to customer service – we’re really chuffed! Today capped off another amazing award-winning year at iiNet by picking up the Gizmodo Reader’s Choice and Editor’s Pick Awards for Best ISP for the second year in a row! We’d like to thank those at Gizmodo – especially their readers who helped make this possible – as well as give a round of applause to all our amazing staff. Awards mean a lot to us, and not just because we love shiny trophies and medals; there’s no better way to test yourself than by going up against dozens of other companies across not just Australia, but the world. iiNet has pioneered a customer service focus in the telecommunications industry for many years, and despite its staggering growth over the last 20 years, our customers’ satisfaction and happiness has been at the heart of how we do business. We may not always get it right, but on the whole we believe the way we do business is the right way. From our record NPS (Net Promoter Score) and Work from Home program to techii™ and our amazing contact centres, we have a lot to be proud of. Each year we love to show off our achievements in front of some very prestigious customer service organisations, including the Australian Teleservices Association, Customer Service Council and Customer Service Institute of Australia. Winning the Best Home/Remote Agent category at the Global Contact Centre World awards. Our work from home program is officially the best in the world! For the first time, winning at the National ATA Awards. Our Perth Contact Centre won the 2013 Contact Centre of the Year >150 FTE category and the whole VCC (Virtual Call Centre) was presented with the 2013 Virtual/Multi Contact Centre of the Year award. 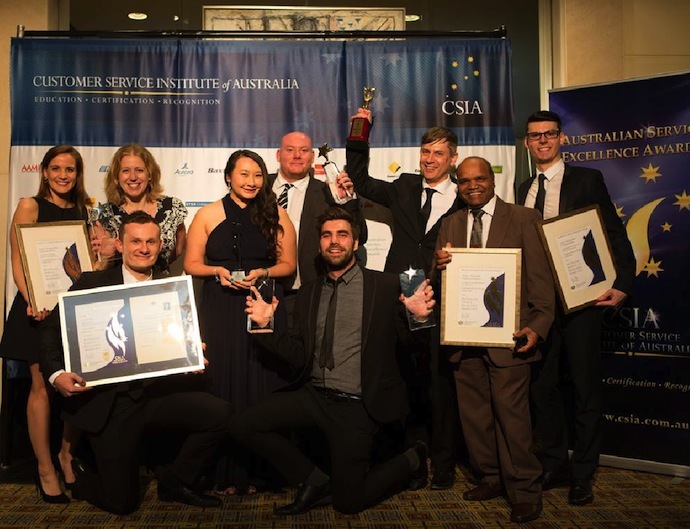 Cleaning up at the Customer Service Institute of Australia (CSIA) awards, picking up 10 awards including the customer-nominated ‘Esi Award’. These awards help us measure ourselves against our competition and let our staff know how they are being appreciated. But we can’t afford to rest on our laurels, competition is fierce and we must continue to lift our game to maintain our position among our customers, and keep winning those awards! So to all our customers, thank you for your ongoing feedback. Without you, we wouldn’t be where we are today. To our awesome staff, these awards reflect all the hard work you’ve put into helping our customers connect better. Overall, I have been very satisfied with the service quality & speed I have experienced in my 14&1/2 years as an iinet customer. The one thing that concerns me is my next to last contact: I had a problem with accessing Google and my webmail from the home page fields. The latter has been worked around (but not actually solved) but the problem with Google not being available throuh the link on the iinet homepage has not been solved. And while Cust Services did start to attend to it, it has been at least a month since I’ve heard from them. Also, if iinet really wants to make it easy for good people to work for them, in addition to the WFHome, it should consider part-timers and/or job-share arrangements (at least after training period is over). Thank you for a most enjoyable and cooperative year. It has been a pleasure to have Westnet as my ISP. I am a customer of yours and have always been a great admirer. your customer care is great. I even changed my mobile phone provision to you even though your plan was more expensive ! And when i discovered that the Optus coverage that you use is pretty hopeless around where i live. You were very supportive and helpful when i spoke to you about having to leave your mobile service. Anyway, congratulations. I know you are worth the awards and I have great taste in ISPs !! merry xmas to all and have been very happy with the service overall except for now with the changes made to the emails I used to be able to delete my trash with one push of the button but now I have to do one at a time,very time wasting and the same goes for the email having to tick each item to delete when prior I could just click on and delete one after the other,I don’t like this setup and feel like it has gone back into the stoneage,it is like double handling. I have been with Westnet for 10 years. Before I went over to Westnet I was with a server who closed there telephones off at 5pm Friday night and re opened them at 8am Monday morning thus if you had a problem STIFF. Swapping to Westnet was the best thing I ever did. Even though I have had a computer for over 10 years I still get stuck. The team at Westnet have always been very Polite, Patient and Understanding with me Well done Westnet and I would recommended you to all my friends any time. Merry Xmas to all the Westnet staff and congratulations on your award. You deserve it. For me you are definately the best internet provider. I have been a customer for a number of years and have always found your customer service to be outstanding.You have gone beyond the call of duty at times helping me set up an Ipad which I should have been asking Apple to do. Many times I have needed your technical help and on each occasion you have solved my problem with patience and have not given up on me. I have never had a problem with deleting emails as the previous person mentioned. They are deleted instantly with one action. Merry Christmas to all the Staff at ‘our’ Westnet,you have all worked hard to achieve your awards and you all deserve a large pat on the back from your bosses and especially from us, for your patience and Help with everything we ask, there’s no problems that cannot be solved by your dedicated Staff. Have a greater year in 2014 and cast your support even further in the future. I have generally been very happy with Iinet’s service. Recently I had a series of problems which were eventually solved with much help from Iinet’s technical support staff. In the process of doing so I spoke to many different people in many different locations. All were friendly and helpful but the ‘techo’ who eventually solved my problem was Luke from Adelaide. When speaking to any Iinet staff it would be great to be able to see a photo of them. That would make the experience much more enjoyable. What do other Iinet customers think ? Congratulations & Well Done iiNet! As an IT Technician of over 25 Years experience (mostly with Banks and their LAN / WAN / Server issues) I have been very impressed with iiNet, their Support and Products. Now, as an IT Consultant, I am constantly recommending iiNet, My Preferred ISP, to my Clients (and Family Members …). Wishing all iiNet Staff a Merry Christmas and a Happy New Year! Thanks for the kind words Jon! Still waiting for 07 3349 1761 to be able to ring 07 3821 6032 direct and vice versa. Waiting to hear from you. I’ve arranged for you to be contacted tomorrow morning. I love Iinet customer service. It is actually very entertaining and the staff are always professional and helpful. They always make me laugh and love the cheers in the background when a problem is solved. The only customer service that I actually like calling One very happy customer.